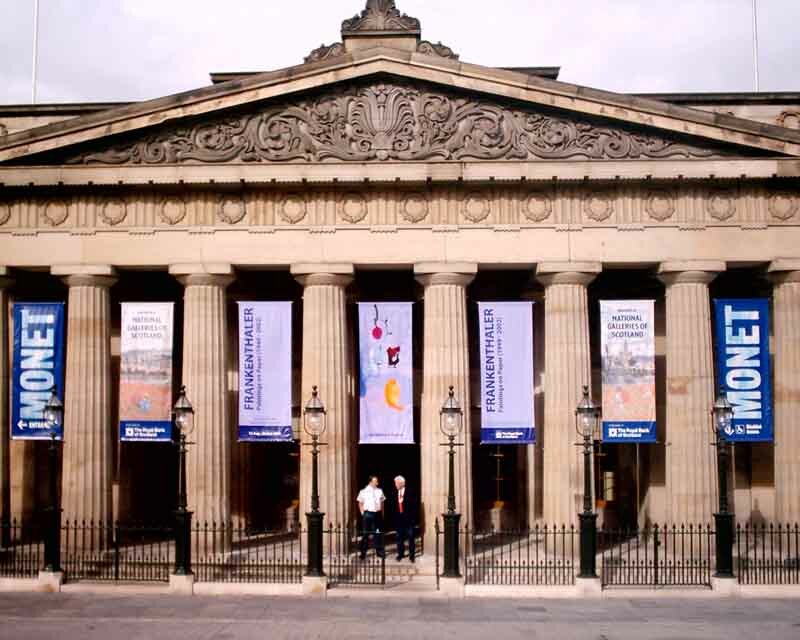 The National Galleries of Scotland announced today a new collaboration with Victor and Carina Contini, the hugely successful partnership that brought the restaurant Centotre to Edinburgh. Show almost anyone around the World a picture of the Mound’s two neo-Greek ‘temples’ & Castle beyond from the Scott Memorial and they’ll recognise it as Edinburgh. 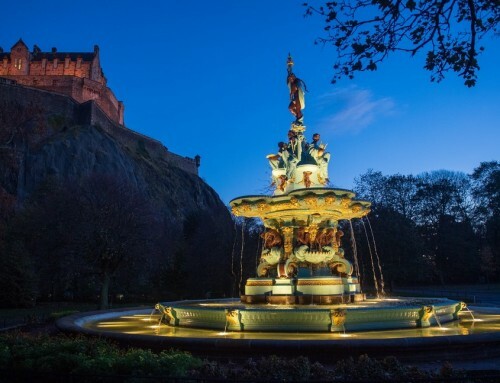 John Miller & Partners weren’t just designing spaces within these temples to art, they’ve been working on a picture postcard, Edinburgh’s trademark canvas, a world-renowned icon. 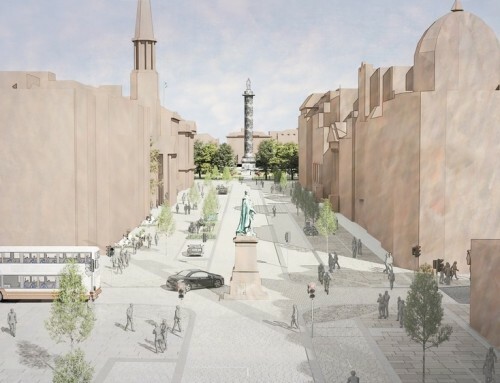 The Playfair Project is halfway through a five-year programme. 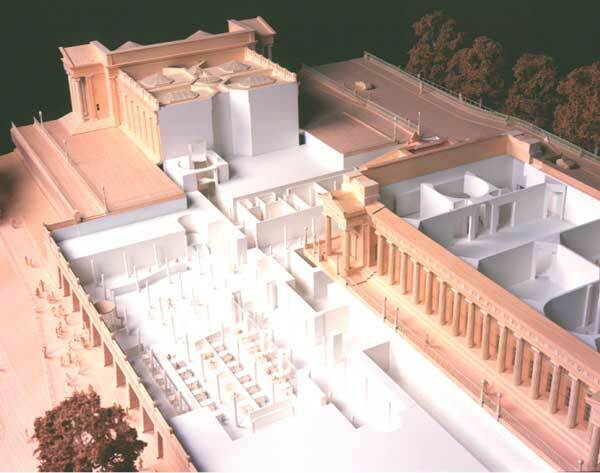 It involves two existing buildings and two phases. 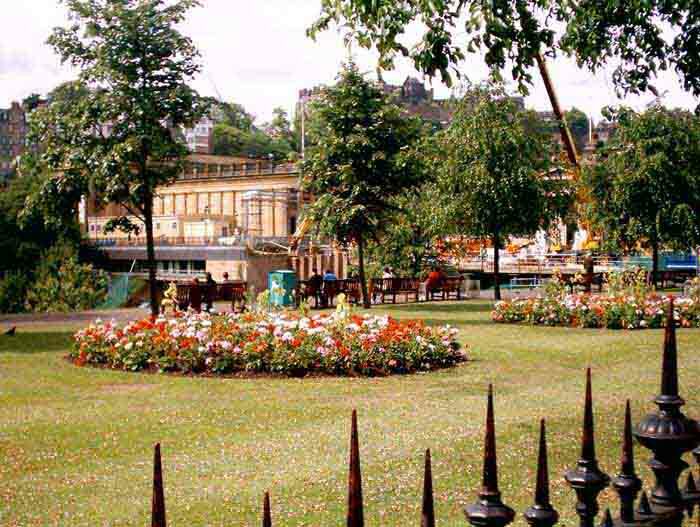 These two buildings, essentially galleries, sit between two halves of Princes Street Gardens, between Old and New Towns. Phase One, started in 1999, opened early August with a Monet exhibition. Phase Two is already underway, in fact they were pouring the last slab as I visited site. 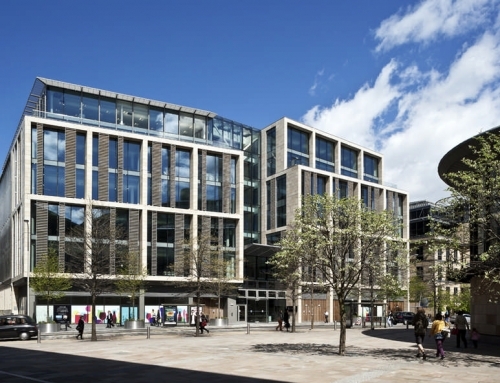 So what is entailed in this rather elusive £30m project set in the heart of Edinburgh? 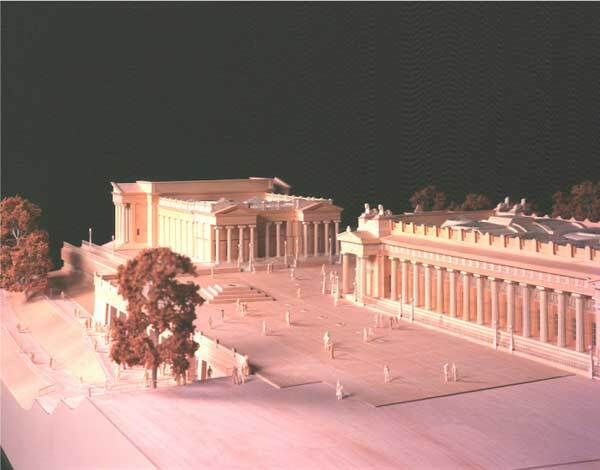 Phase One started with massive underpinning – 350,000 litres of concrete – to Playfair’s early 19th century dried-out ‘Venetian raft’ foundation. 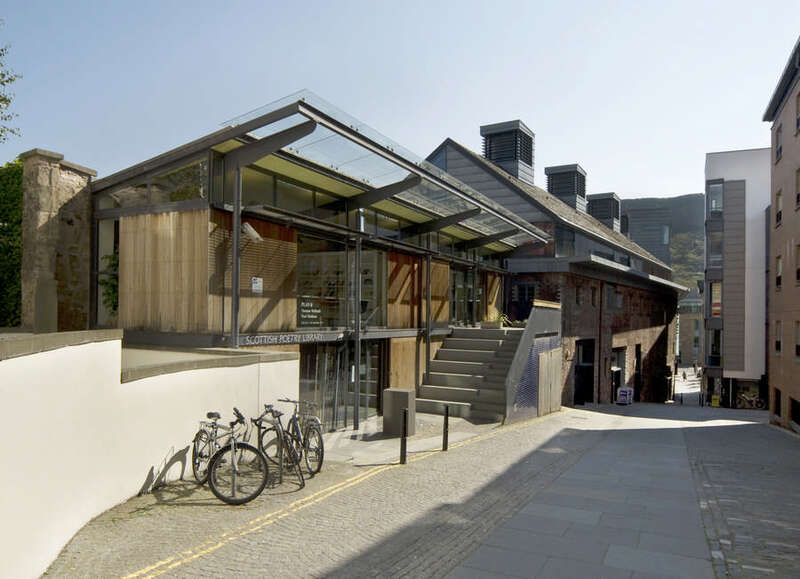 There followed a subtle refurbishment of the classical Royal Scottish Academy (RSA), the key interventions being part of a cruciform gallery link, under the main galleries, connected with a spectacular staircase. 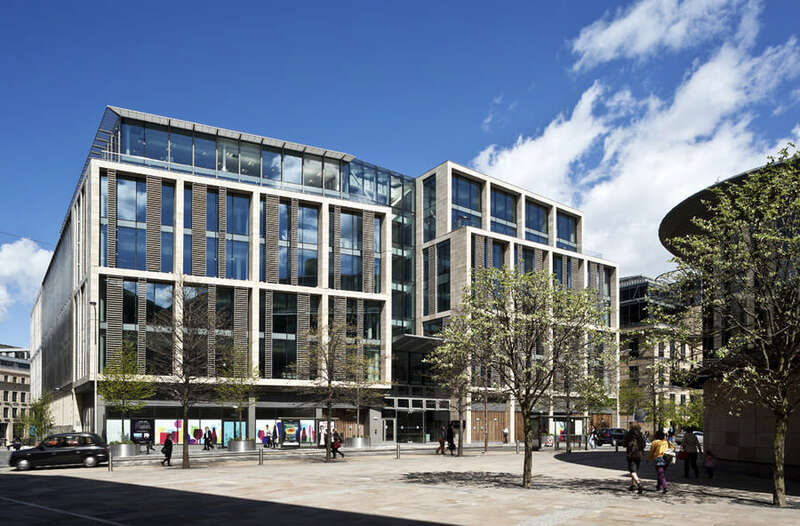 Phase Two finishes the cruciform by forming primarily dining and educational spaces below the RSA and the National Gallery of Scotland (NGS). Before we discuss the phases in more detail, what is the established relationship of the Mound to Edinburgh and its history? 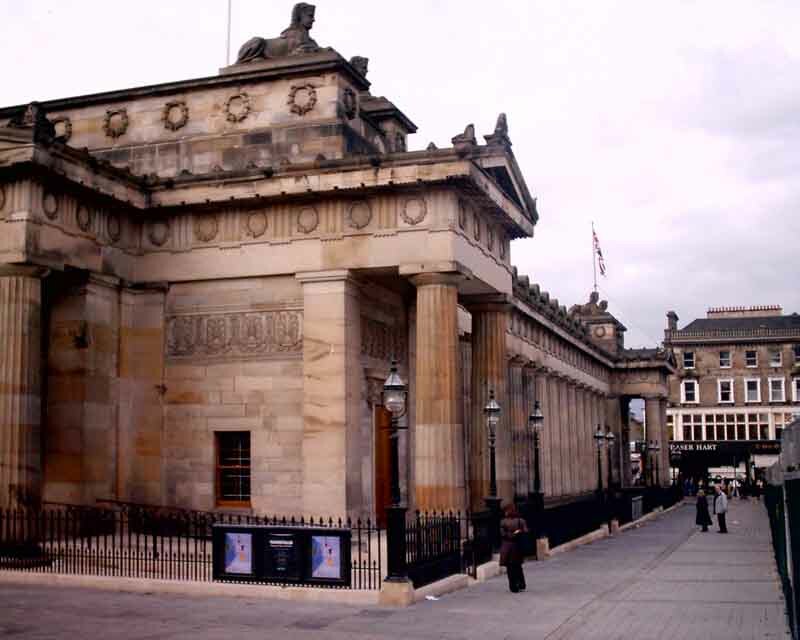 An axis runs north-south through Hanover Street, part of James Craig’s Edinburgh New Town, and visibly terminates in the RSA’s Doric facade onto Princes Street, notably its centrepoint, the statue of Queen Victoria  atop the portico [the RSA dates from 1822-26, enlarged, again by William Playfair in 1831-36]. 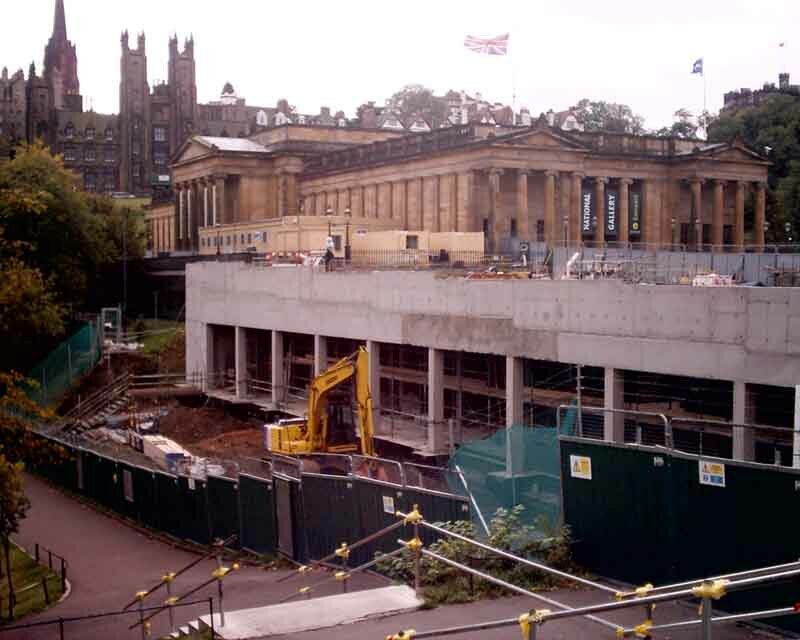 It heads south to pick up the western facade of the NGS [Playfair’s last building, 1850-59, he died in 1858] and up to the current Parliament, the New College & Assembly Hall, also by Playfair [1845-50]. The view is terminated to the south by Tolbooth St John’s spire (now the Hub, 1839-49, Pugin & Gillespie Graham) and to the north, by distant Fife. The New Town plans adopted in 1767 (based on Craig’s plans of 1766) fulfilling Drummond’s vision of 1763 included no buildings in this space. Formerly the RSA was the Royal Institution and the NGS building was bizarrely split down the middle to house two galleries, hence the porticoes down each side. Phase One’s staircase wraps Pouilleney limestone around a circular etched glass lift, without touching it. Within the lift you can look up through glazing to a conical light. This continues Playfair’s theme of toplit galleries. The clean white fibrous-plastered cone with invisible glass framing is almost Turrellesque. Around the stairs a subtle stone-coloured Armorcoat adds patina. The stair nosing strips, floor dividers and handrails are all bronze. Movement is celebrated: down in the lower galleries the subtle arrival of the lift – through etched glass – can be seen via enfiladed rooms. The latter are connected by Sapelle mahogany (akin to black walnut) doors, normally open, set within the walls. 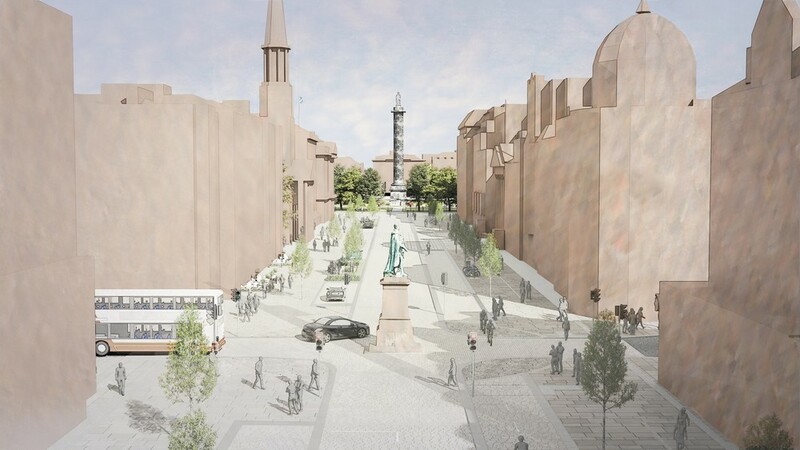 Playfair’s original plan is good, thus fairly untouched – few corridors and ideal for security. The neo-Greek interiors are almost entirely 1910 Oldrieve, inserted Edwardian into Playfair’s late Georgian. So this is Phase One, discreet services upgrade, restoration and bold insertion of vertical circulation. This Phase is topped off with a wonderful ‘James Bond’ moment, the ‘hidden’ art handling door. Rather than reconfigure the Grade 1 Listed exterior’s small tradesman’s door, a whole chunk of stone facade is cut free. It slides, then pivots, to allow in large works like a secret bookcase – a magical and clever design. Phase Two is almost entirely new-build, mostly carved from the great mound of spoil dumped into the former Nor’ Loch to allow carts across to the New Town. It threads between the two buildings’ lower levels and its only facade nudges 5m east into the gardens. 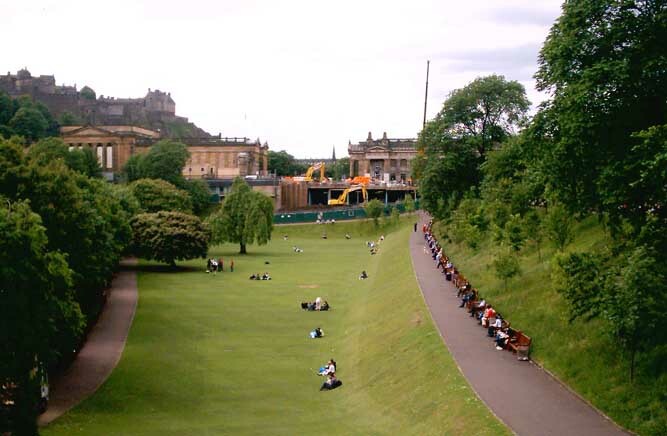 Here a two-line Act of Parliament was required for the 35m long extension into these highly protected gardens. 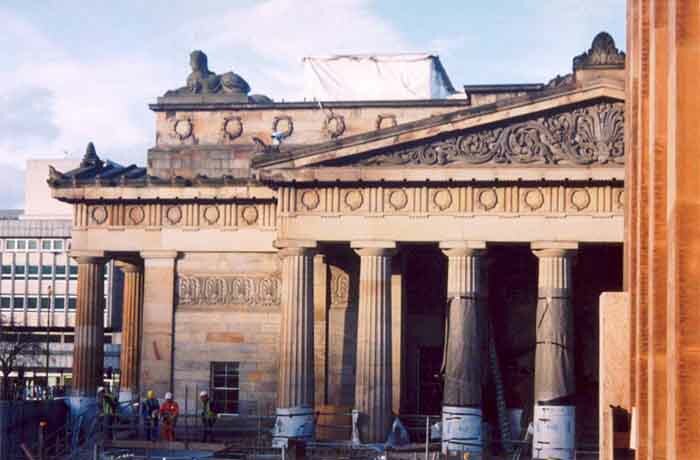 Phase Two’s roof is called the Plateau, effectively Edinburgh’s Trafalgar Square. Most marches and demonstrations gather here, hence the City Council’s rather onerous weight loading based on a Challenger 2 tank. The shift in axis between the two original buildings is a delicious counterpoint to the formal parti. Key architects in the project – John Miller, Su Rogers and John Carpenter – have picked up on this irregularity with their ‘pyramid’ between the two buildings, four steps high, set off-axis to the East. It ‘turns the corner’ between spaces a la Regent Street’s All Souls; slight rotation emphasises its three-dimensional form to the approaches. It also replaces steps now concealed behind replaced railings. The whin, granite and Caithness paving is punctured by eleven circular rooflights, civilising Phase Two’s IT Gallery and shop with natural light. Phase Two’s spaces are hard to discern from the rude blockwork on site, but already a feel for the restaurant’s three levels stepping down to allow views is evident. 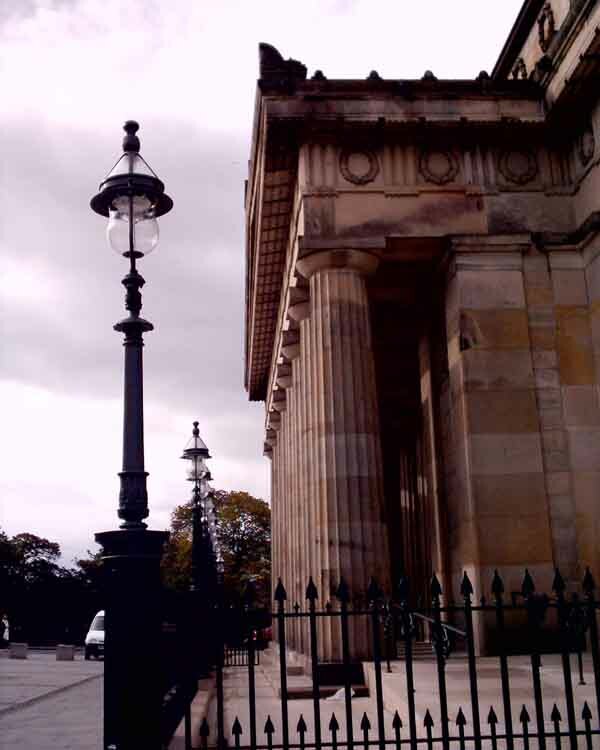 The outward aspect takes in the Scott Memorial, Waverley, Arthur’s Seat and the Bank of Scotland. The latter’s strong rustication is picked up in Phase Two’s stone buttresses framing huge picture windows. 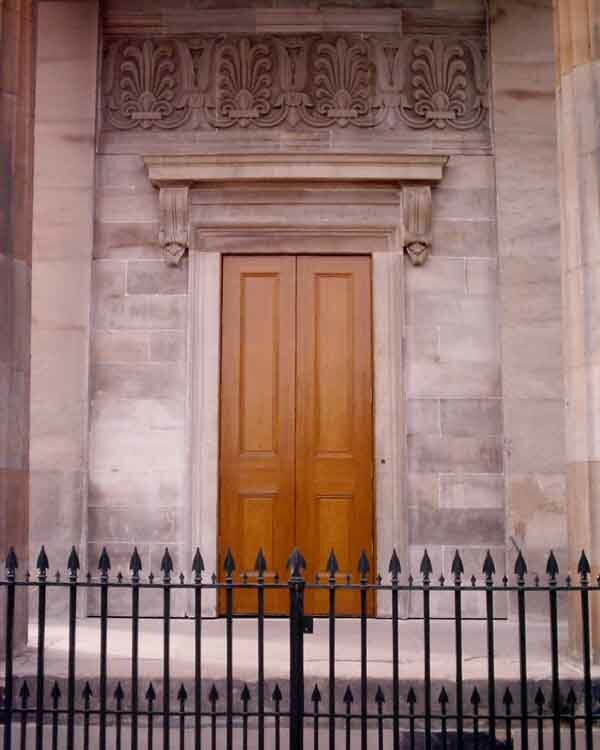 The cladding is Clashach stone from Moray, north-east Scotland. 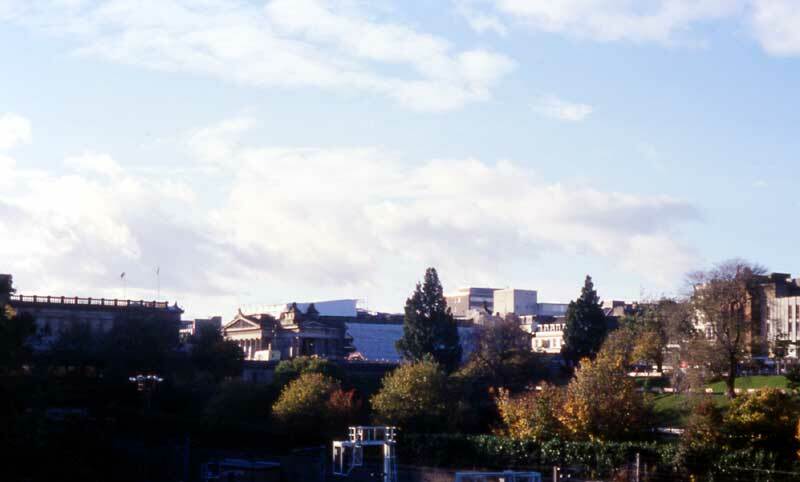 Edinburgh quarries originally used for the RSA could not be accessed: Craigleith is a Sainsbury’s, Hailes is in the green belt and Binny, used for later repairs, is a landfill. The fields selected aren’t as strongly patterned (less iron) as those used for Benson & Forsyth’s Museum of Scotland and BDP’s Scottish Widows. Entry to Phase Two is through a revolving door onto the gardens, set slightly off-axis to the East-West space. 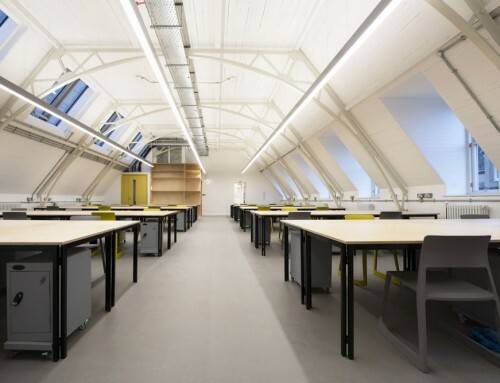 Ahead lies an IT Gallery, and beyond, a 200-seat lecture theatre, seminar and education rooms. 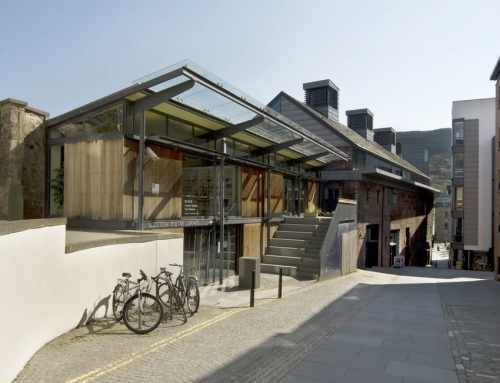 The black box lecture theatre is logically set at the west end (no windows), with the restaurant, café and shop to the fenestrated elevation. The RSA and the National Gallery will be accessed directly from the link by circular staircases and lifts. To the south are the 1978 Property Services Agency NGS offices, expressed with ribbon windows; consequently the stone structures above seem to float rather ungainly in the evening when the lights are on, especially in Winter’s dark afternoons with few leaves to hide the view. 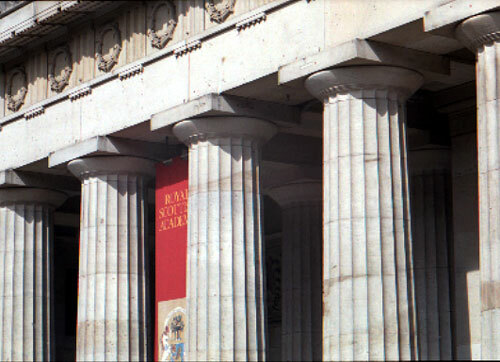 Presentations from architects shortlisted in the 1999 competition are exhibited in Gallery 7 of the RSA. Centrepiece is a large wooden model of the winning project. 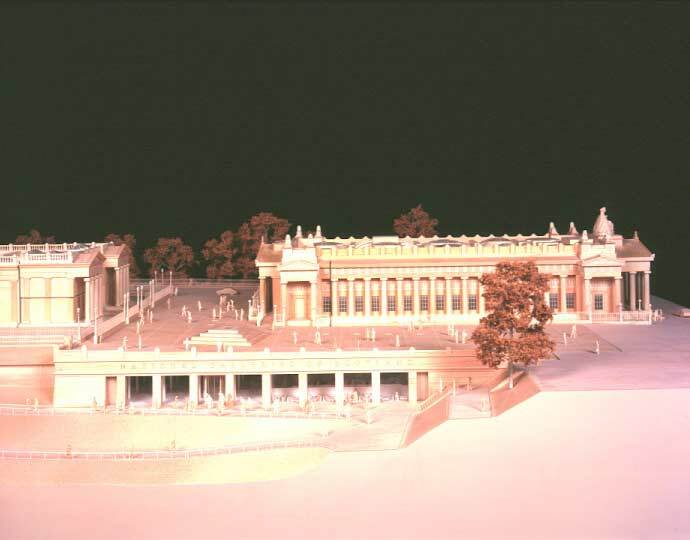 The unsuccessful architects were Simpson & Brown and Pawson Williams, Mecanoo, Terry Farrell & Partners, Law & Dunbar-Nasmith and Richard Murphy. 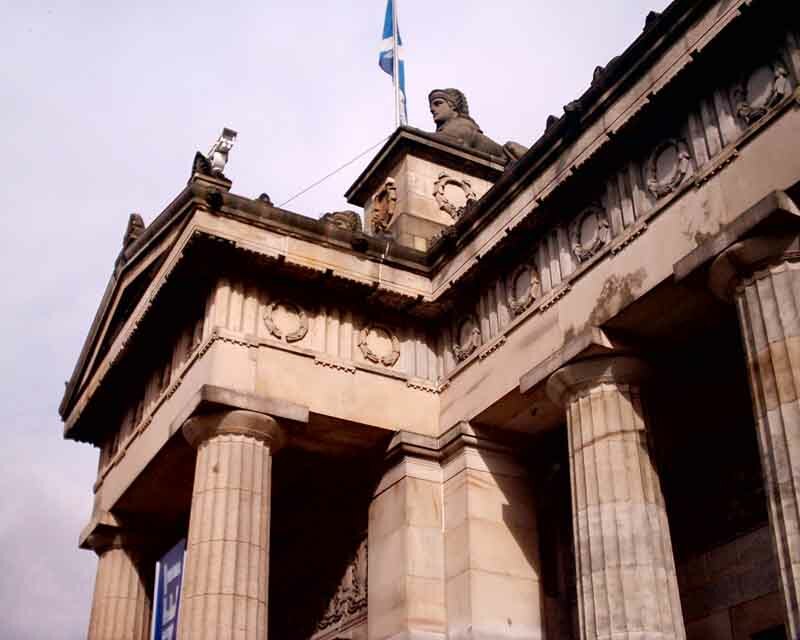 The jury included Sir Timothy Clifford, Director-General of the National Galleries of Scotland, and Rick Mather. John Miller & Partners have a celebrated pedigree when it comes to Galleries: Tate Gallery of British Art, The Fitzwilliam Museum, Whitechapel Gallery and the Serpentine Gallery. Almost 1500 sq metres of restored gallery space are housed in eleven galleries. Monet: The Seine and the Sea would have been impossible without the RSA’s restoration. The National Gallery lacked the facilities to host larger travelling exhibitions and the RSA, which had the space, had need of repair for many years. The Playfair Project is a success. Galleries were not closed for a single day. Two great 19th-century landmark buildings were restored and linked with little disruption to the Gardens. Phase Two is due for completion on budget and ahead of schedule, in August 2004. The architecture is restrained and polite, the sign of a confident architect. The picture postcards, in fact, almost don’t need to be recreated.